What makes some leaders come across as motivational visionaries who care about their people while other leaders don’t come close? How do you become an engaging, enthusiastic, inspirational leader … you know … the boss everyone says great things about and actually means it! How do you leap to the next level of leadership? 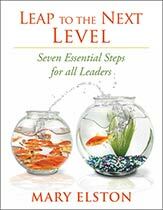 In this straightforward, refreshingly compressed and easy to consume read Mary Elston provides a real world look at seven essential steps all leaders must take to move their career forward. Based on over twenty five years of observations of selected, outstanding executives, key factors every aspiring leader must include in their skillset are encapsulated in easy-to-apply examples. In this condensed overview you’ll discover seven compelling components which will contribute to your leadership proficiency and help you move to the next level in your career. Subtle differences between impersonal and impressive leadership behavior are revealed, along with how to enhance your ability to be perceived as a leader, how to embrace the habit of being a strategic thinker as well as highly effective techniques for communicating with leadership qualities. For the many leaders in training, in waiting, and impassioned to take the reins of a position in the upper ranks, don’t delay. It’s time for you to leap to the next level — your success and career destiny are waiting for you! Master Your Middle Management Universe, How to Succeed With Moga Moga Management Using 3 Easy Steps! Managing day to day deadlines can be challenging enough, but what about managing people? How do you come across as a leader and do it in a way that quickly generates respect, buy-in and enthusiasm from your team? Master Your Middle Management Universe will take you there! You’ll learn how to take your management skills a step higher by using simple, yet effective leadership techniques. Whether managing projects, running a department, or leading a company, this program will help you become a member of “make a difference” management. Expertise you’ll gain includes: How to make sure you are leading your team in the right direction, the best way to get started with a new group, how to spot problem areas and address them head on, how to hold meetings the right way, and much more. By applying three easy steps, Master Your Middle Management Universe helps you discover how to take a fresh “badda bing” approach to people management and become the manager everyone wants to work for! You know you’re ready to get started, explore the book now! 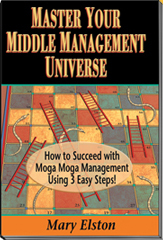 Read More about Master Your Middle Management Universe, How to Suceed with Moga Moga Management Using 3 Easy Steps!